211 Bernard: William H. Gaddiass Jr.
William H. Gass should not be confused, though it is understandable why he might be, with William Gaddis, another major 20th century novelist recently featured on the blog (for the new edition of his first novel, The Recognitions, put out by the Dalkey Archive Press and for which Gass writes the introduction). Born two years apart, both Gaddis and Gass have achieved the level of notoriety of adjectification, i.e. something or one can be "Gassian". 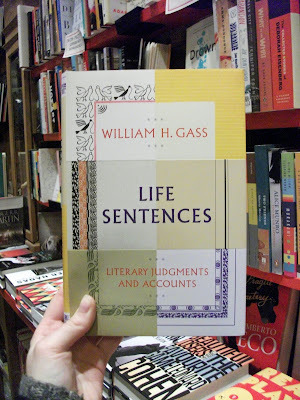 William H. Gass, another author I should read. This may be a good entry point: Life Sentences: Literary Judgments and Accounts is a new collection of essays which covers both the theory (on metaphor, mimesis and sentence structure) and practice (on Kafka, Nietzsche, Proust) of his literary criticism.